Each year, the Pat Gustke Sustainer of the Year award is awarded to League Sustainers whose strength and character embody the League’s slogan, “Women building better communities.” Winners display a sustained commitment to their volunteer work and serve as inspirational role models for all members of the Junior League and our community. The winners will be honored at the Spring Sustainer Dinner on May 24, 2018 and presented with a cash stipend for the organization of the winner’s choice. The 2018 PAT GUSTKE SUSTAINERS OF THE YEAR! Three amazing women embody the League’s Mission in their sustained, exemplary volunteer involvement throughout the community. Dawn Bussey, Stacy Galasso and Kristen Brown have been selected as the 2018 Pat Gustke Sustainers of the Year! Please join us for the Sustainer Spring Dinner on Thursday May 24th at 6 pm at the Almaden Country Club as we honor these amazing women. A brief summary of their exemplary voluntarism is listed below. “Volunteers like Dawn come along maybe once in a school’s lifetime,” says Anita Lee, Principal of Cherry Chase Elementary School. As a community volunteer, Dawn has used her Junior League training to make a significant impact at Cherry Chase for over 16 years. During that time, she performed every conceivable job within the PTA. In addition to reorganizing and advising the board to ensure that they are set up for success year over year, Dawn also chaired the Walk-A-Thon & Auction for five years, the Fall Festival for four years, and brought multiple programs and events to the school, including Project Cornerstone and the Diwali Festival (a collaboration with the local neighborhood association). Under Dawn’s leadership the Walk-A-Thon fundraiser committee grew from 6 tired volunteers to a committee over 35 parents and profits increased from $25,000 to $150,000. 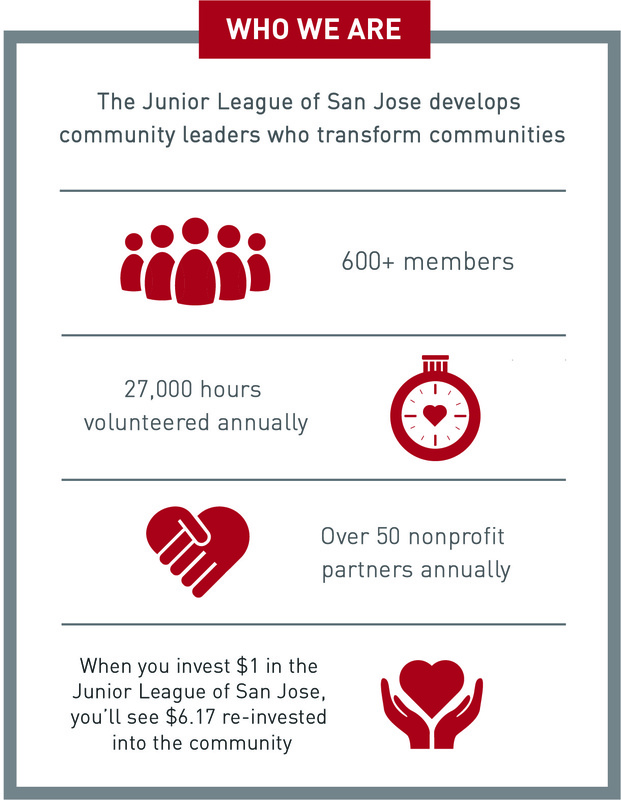 Informally, Dawn gives her time to mentor and consult with fellow volunteers, various non-profits and organizations, including the Junior League of San Jose. As a sustaining member, Dawn currently serves as Co-Chair for the Volunteer Recognition Luncheon. She is an inspiration to women who strive to make a difference. Passionate about children, family, and women’s leadership, Dawn is always looking for little ways to make work and volunteering fun and engaging. As a natural connector of people, she thoroughly enjoys getting to know people from all walks of life and is a talented community leader. Stacy Galasso credits the Junior League of San Jose with helping her to gain valuable public speaking skills that have allowed her to “be heard and to lead in the community.” As a board member and advocate for the March of Dimes, Stacy used those skills when she traveled to Washington DC on behalf of the March of Dimes, voicing the organization’s support for the Children’s Health Insurance Program (CHIP), designed to provide low-cost health coverage for children in families that earn too much for Medicaid but not enough for self-funded care. She has served on the Board of Directors of the March of Dimes, chaired their fundraising gala and served on the gala fundraising committee. In addition to her work with JLSJ, her children’s schools the March of Dimes, and numerous other organizations Stacy gives generously of her time to support the House of Grace, a CityTeam Ministries-sponsored apartment complex. For the past seven years, Stacy has volunteered at The House of Grace preparing and serving meals for residents throughout the year including Thanksgiving dinner. Beyond her hands on work at the House of Grace, Stacy secured a $5,000 grant for operations. Stacy is an effective and tireless volunteer, a dedicated mother and wife and community leader who can be counted on to get things done. When the principal at her children’s elementary school asked Kristin Brown for help, she never imagined that she would end up volunteering over 2,000 hours to teach reading at Landel’s Elementary School in Mountain View. But noticing that job turnover was a constant issue at all levels of her local schools, Kristen wanted to make a difference; and she definitely has. Kristen has served as PTA president for her local elementary, middle and high schools, chaired school auctions, grad night parties and staff appreciation events. Kristen believes that having a strong PTA/PTSA is important because schools are working with fewer resources making the needs constant. “The fast-paced environment in the Valley forces schools to struggle to keep up,” says Kristen. For the past 11 years, she has consistently volunteered five hours a week teaching reading. Ten of those years have been dedicated to supporting the same teacher. Kristen gives one-on-one attention and support to the students, which is critical to their success. Kristen also serves her community as volunteer with the American Cancer Discovery Shop in downtown Los Altos, 100 Women Charitable Foundation and the Princess Project where she supports the Dress Giveaway and assists with long-range planning. According to Kristen, it is her JLSJ friendships enthusiasm that lead her to stay involved with this project. Kristen’s steadfast support of local nonprofits and schools have helped families, administrators, teachers and kids to have a better opportunity to succeed in our community.